Covenant Health has the region’s only stroke hospital network for delivering advanced diagnostics and treatment to halt the devastating effects of stroke. At the hub of the network are Fort Sanders Regional Medical Center and the award-winning Patricia Neal Rehabilitation Center. Fort Sanders is a Stroke Center of Excellence, and the only facility in the region to hold both a Comprehensive Stroke Center certification from The Joint Commission and two separate stroke accreditations from CARF (the Commission on the Accreditation of Rehabilitation Facilities). When a stroke happens, timely treatment is critical. The clock starts with the onset of symptoms. As time ticks by, treatment options become more limited and patients can begin to lose functionality. Covenant Health’s hub-and-spoke model gives us an edge when it comes to stroke treatment. 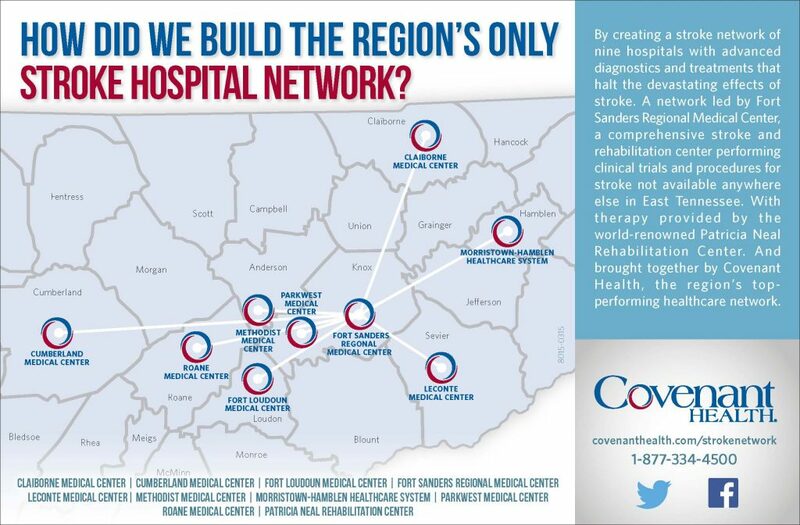 We work with outlying hospitals to respond quickly and get patients to Fort Sanders Regional.